From the 4th of November 2015 to the 10th of January 2016 the Hermitage presents an exhibition called 'Frida Kahlo. Self-Portrait with Monkey' form the series 'The Masterpieces of World Museums at the Hermitage'. This is the first time that the artworks of the famous Mexican painter, from the collection of the Dolores Olmedo museum (Mexico), have been presented at the Hermitage. 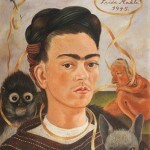 In total 25 of Frida Kahlo's paintings are being exhibited. They can be seen in the Eastern Gallery of the Winter Palace (hall 152).